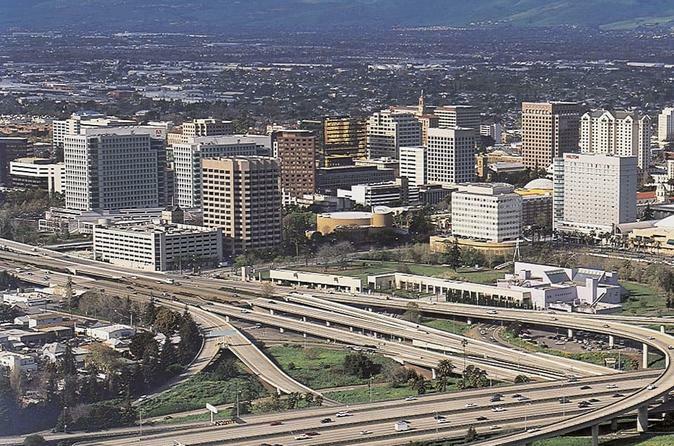 San Jose is an economic, cultural, and political center of Silicon Valley and the largest city in Northern California. With an estimated 2017 population of 1,035,317, it is the third most populous city in California (after Los Angeles and San Diego) and the tenth most populous in United States. Located in the center of the Santa Clara Valley, on the southern shore of San Francisco Bay, San Jose covers an area of 179.97 square miles. San Jose is the county seat of Santa Clara County, the most affluent county in California and one of the most affluent counties in the United States. San Jose is the largest city in both the San Francisco Bay Area and the San Jose-San Francisco-Oakland Combined Statistical Area, which contain 7.7 million and 8.7 million people respectively. Winchester Mystery House, Mission Peak, The Tech Museum of Innovation, Happy Hollow Park & Zoo, Downtown San Jose, Children's Discovery Museum of San Jose, Sunol Regional Wilderness, Rosicrucian Egyptian Museum, Alum Rock Park, Japanese Friendship Garden, Rancho San Antonio County Park, Japantown, Mission Peak Regional Preserve, History Park at Kelley Park, San Jose Municipal Rose Garden, Almaden Quicksilver County Park, Shoreline Park, Mountain View, Rose Garden, Hakone Gardens, Don Edwards San Francisco Bay National Wildlife Refuge, Kelley Park, Lick Observatory, Mount Hamilton, Ed R. Levin County Park, Mount Umunhum, Guadalupe River Park, Fremont Older Open Space Preserve, San Jose Museum of Art, Santa Teresa County Park, Stevens Creek, Santa Clara Valley, Emma Prusch Farm Park, Montalvo Arts Center, Plaza de César Chávez, Lexington Reservoir, Mission Santa Clara de Asís, Lake Cunningham, Cathedral Basilica of St. Joseph, Arastradero Preserve, San Jose City Hall, Raging Waters San Jose, Alviso Marina County Park, Stevens Creek County Park, New Almaden, Heritage Rose Garden, Hellyer County Park, Sierra Azul Open Space Preserve, Sierra Vista Open Space Preserve.